Goishicha (碁石茶) is a post-fermented Japanese tea. The tea takes its name from its resemblance to goishi, the stone playing pieces in the board game called Go. 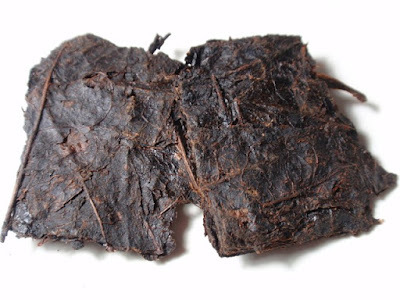 Post-fermented or dark teas are called ato-hakkou (後発酵). Goishicha is believed to have first appeared in Japan during the 18th century. Originally, the corners of the tea were rounded after drying, more closely resembling go stones, and the tea was allowed to age several years before consumption. Production of goishicha was at its height as a tea export during the late 19th century to early 20th century before demand dropped off and, by 1966 only 13 tea farms producing the tea remained with only one person producing goishicha by 1975. Thanks to renewed interest, there are now several goishicha producers. Goishicha is produced almost exclusively in Otoya in Kochi Prefecture. Bancha tea leaves are harvested in mid-July. The leaves are steamed for 1 to 2 hours and the juices are saved for the second step in the fermentation process. For the first stage, the leaves are covered and stored for 7 to 10 days to allow aerobic fermentation to develop. For the second stage, the leaves and the juices from the steaming process are added to a barrel, weighed down, and stored for 10 to 20 days during which Lactobacillales (lactic bacteria acid) will develop. Then the leaves are stacked and cut in 2.5cm by 4 cm rectangles. Finally, the tea is dried in the sun. Heat water to 208°F/98°C, add 1 piece of goishicha, and steep for 4-5 minutes before serving. Goishicha may also be served cold and has been used as an ingredient in rice porridge.